Do you want to pursue a career in mental health? To properly care for or diagnose and treat people who have mental illnesses, emotional difficulties, and behavioral problems it is essential to have excellent listening, verbal communication, interpersonal, critical thinking, and decision making skills. These soft skills will help facilitate your interactions with individuals who are in distress. Here are some mental health careers to consider. All have excellent job outlooks with employment expected to grow at least faster than the average for all occupations between 2016 and 2026. Clinical and counseling psychologists diagnose and then treat people who have behavioral, emotional, and mental disorders. They also help their clients and patients deal with crises, illnesses, or injuries. To become a psychologist, earn a Ph.D. or Psy.D. degree in psychology. It will take between five to seven years to complete either of these doctorates. Marriage and family therapists help couples, families, and individuals overcome or learn how to manage mental illnesses and disorders within the context of their relationships. To work in this occupation, a master's degree in marriage and family therapy is required. 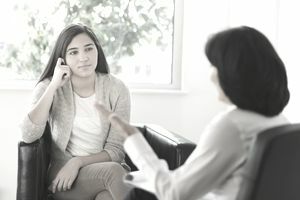 Clinical social workers diagnose patients' mental, behavioral, or emotional disorders and then provide treatment through individual and group therapy. To become a clinical social worker, you must get a Master's Degree in Social Work (MSW). Psychiatric nurses are registered nurses (RNs) who specialize in psychiatric and mental health work. They care for patients who have mental, behavioral, and emotional disorders. Nursing education programs, including those that culminate in a bachelor's of science degree, an associate degree, or nursing diploma, include psychiatric-mental health education. (Psychiatric-Mental Health Nurse. Nurses for a Healthier Tomorrow.). Like RNs, Nurse practitioners (NPs) can also specialize in psychiatry and mental health. They provide assessments and therapeutic interventions to patients with psychiatric disorders and addictions in outpatient and inpatient settings. After becoming licensed as an RN, you must earn a master's degree or doctorate in nursing practice and get a state-issued NP license. Psychiatrists are physicians who specialize in treating psychiatric disorders. To become a psychiatrist, you will first have to complete four years of medical school after earning a bachelor's degree. Then you will have to do a four-year residency in psychiatry (Association of American Medical Colleges). To practice, a medical license and certification from The American Board of Psychiatry and Neurology or the American Osteopathic Board of Neurology and Psychiatry are required. Mental health counselors help people overcome emotional and mental disorders and addictions. You will need to earn a master's degree in mental health counseling or a related field of study, as well as get a state-issued license, to work in this occupation. Sources: Bureau of Labor Statistics, Occupational Outlook Handbook, 2017 and Occupational Employment Statistics, 2018.